The German Federal Ministry for Economic Cooperation and Development commissioned a study to compare the Voluntary Guidelines on Land with the IFC Performance Standards and the World Bank Environmental and Social Safeguard Framework. 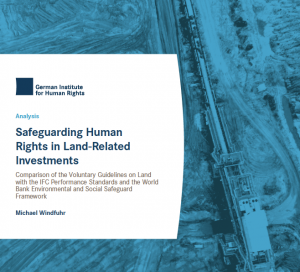 The result is the analysis ‘Safeguarding Human Rights in Land-Related Investments’ which was written by Michael Windfuhr and published early 2018. The study can be downloaded here: IfM – Analysis voluntary guidelines 2018. The study aimed to help identify whether there are topics and potential issues in the VGGT that are currently omitted or only partially covered by the IFC PS or the World Bank Safeguards. It also discusses how potential gaps might be addressed and whether there are issues that require closer examination and further investigation in order to provide a complete and adequate framework/international legal instrument committed to ensuring the respect for and implementation of human rights.